The SRF485WPR is a water resistant single transducer ultrasonic ranger. The SRF485WPR uses the RS485 standard for communications, for up to 127 modules on each RS485 bus. The SRF485WPR features an on-board 5v power regulator which can be supplied from 8vdc to 14vdc. Both power and RS485 signals are supplied to the module via a 10pin IDC connector, making cabling a large number of modules very easy. The Range of the SRF485WPR is 60cm to 5meters. Note- This sonar has a waterproof transducer, not an underwater transducer. It is designed for operation in air. Voltage - 8v to 14v, 12v nominal. Up to 127 SRF485WPR's connected to your controller. Units - Range reported in uS, cm or inches. 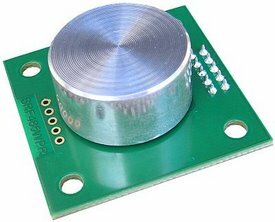 Get Ultrasonic sensor with Water proof (RS485 interface) (SKU:SEN0071) from DFRobot Store or DFRobot Distributor.